Anthony Ujah had nothing but praise for Mainz teammate, Robin Quaison, after the Nigeria international netted the winner in his side's 1-0 win over Stuttgart in the opening round of the Bundesliga on Sunday afternoon. 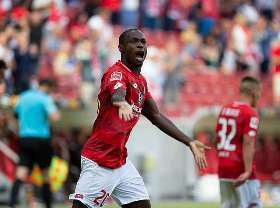 Ujah slotted home in the 76th minute, nine minutes after coming off the bench, after receiving a pass from the Swede, his first Bundesliga goal since the 2015-2016 season. ''I think the goal belongs to Quaison because he made life very difficult for Badstudber and he made him very uncomfortable,'' Ujah said post-match. ''At the end he got the ball on his feet and I just needed to show him where, which position I have to be to score and luckily he found me. Following his goal against Stuttgart, the former Werder Bremen and Cologne star has found the net 24 times in 88 games in the German topflight.